The amazing weather in San Diego became the witness of the awesome jQuery Conference held this week. The keynotes were entertaining, the talks were inspiring (the videos will be available in the near future), and of course nothing beats meeting folks from this vibrant jQuery community. Beside that, of course meeting old acquitances and making new friends are fun! It’s also nice to have a face-to-face meeting with folks I’ve known only from hitherto online interactions. The conference itself was professionally organized and it’s simply fantastic (check out some pictures by @gseguin on Flickr). Kudos to the sponsors, organizers, and everyone involved in making such a memorable event! 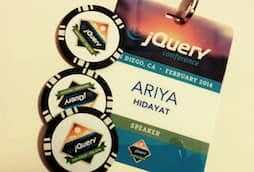 This jQuery Conference is the start of my winter/spring conference tour. My next stop will be a bit farther: DevNexus in Atlanta.